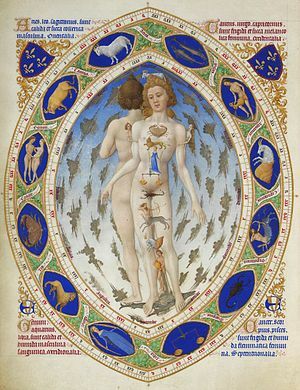 ^ "Rulerships and Qualities: Anatomy and Physiology Correlated to the Zodiac". The Rosicrucian Fellowship（英语：Rosicrucian Fellowship）. Retrieved 2011-06-19. ^ "Medical Astrology". 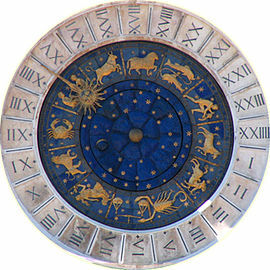 blog.indianastrologysoftware.com. Astrovision Futuretech Pvt Ltd.
Warren-Davies, Dylan. 2000. Astrology and Health: A Beginner's Guide, 2nd ed. Hodder & Stoughton. 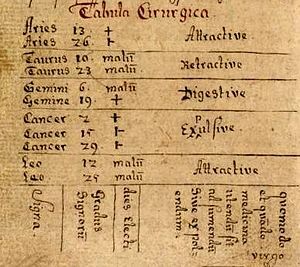 Nicholas Culpeper: Semeiotica Uranica: Or an Astrological judgment of diseases from the decumbiture of the sick; 1. From Aven Ezra by way of introduction. 2. From Noel Duret by way of direction. Wherein is layd down, the way and manner of finding out the cause, change and end of a disease. 190 pages. Nathaniell Brooke, London 1651; edition 1655 (includes Ibn Ezra's Critical days) Digitalisat from Paulo Alexandre Silva; new edition at Kessinger Publishing, 2004 ISBN 978-0766185784. This page is based on the Wikipedia article 醫療占星術; it is used under the Creative Commons Attribution-ShareAlike 3.0 Unported License (CC-BY-SA). You may redistribute it, verbatim or modified, providing that you comply with the terms of the CC-BY-SA.